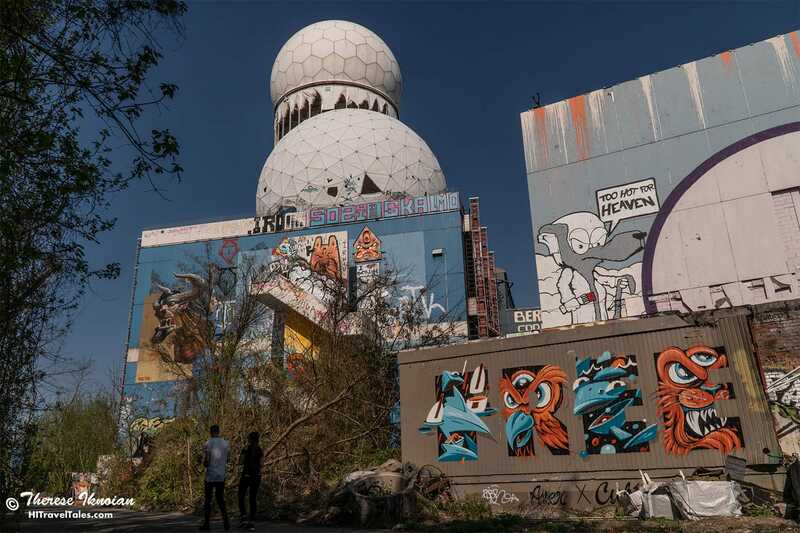 Teufelsberg Berlin is at once bizarre, haunting, edgy, eerie, beautiful, inspiring, and unnerving. And frankly wandering among the rubble and ruins of the former National Security Agency listening post is too perhaps a little dangerous. 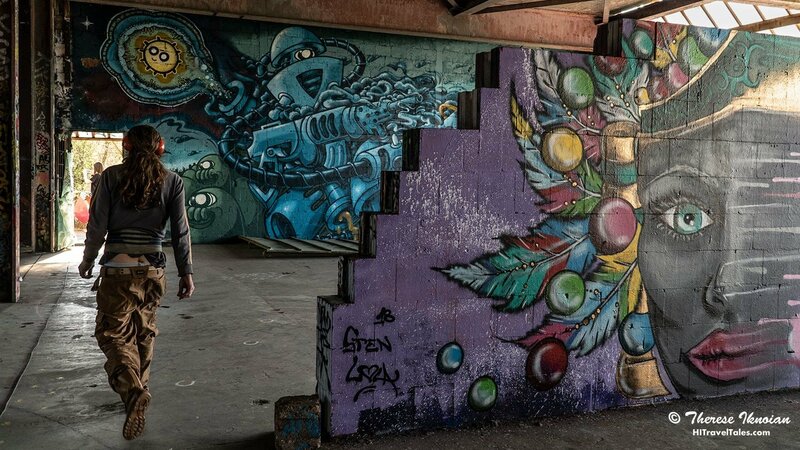 And all of this makes it a perfect haven for street and urban artists from around the world. 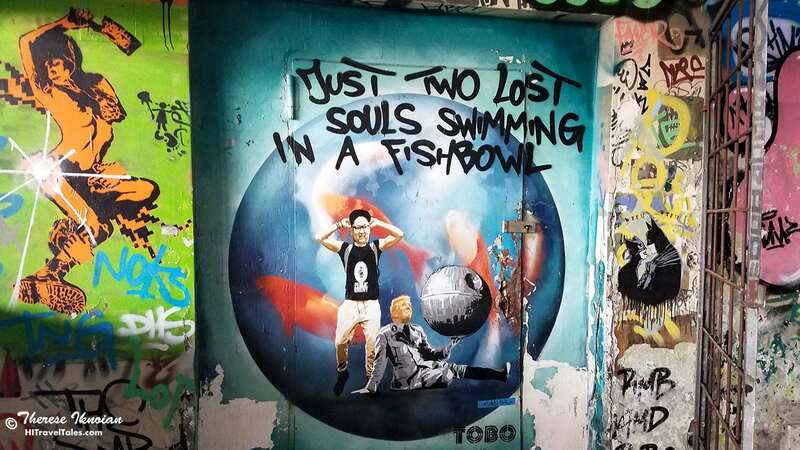 And a must-see sight for anyone else who loves street art or visiting an off-beat attraction. 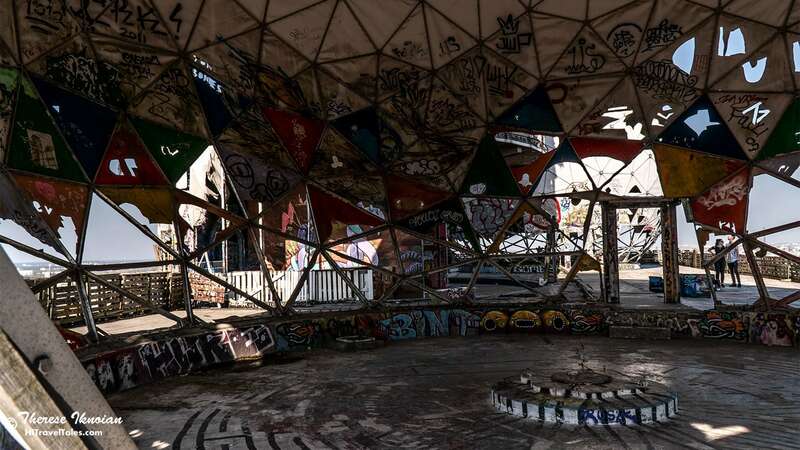 Built entirely from post-WWII debris hauled to the woods from Berlin’s war devastation, Teufelsberg (at 394 feet or 120 meters, and the highest hill in Berlin) was turned into a listening station in the ‘60s and operated by the U.S. NSA in partnership with British intelligence. 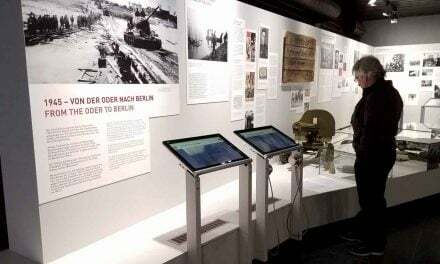 The listening station’s purpose was to eavesdrop on communist East Berlin a short distance away. 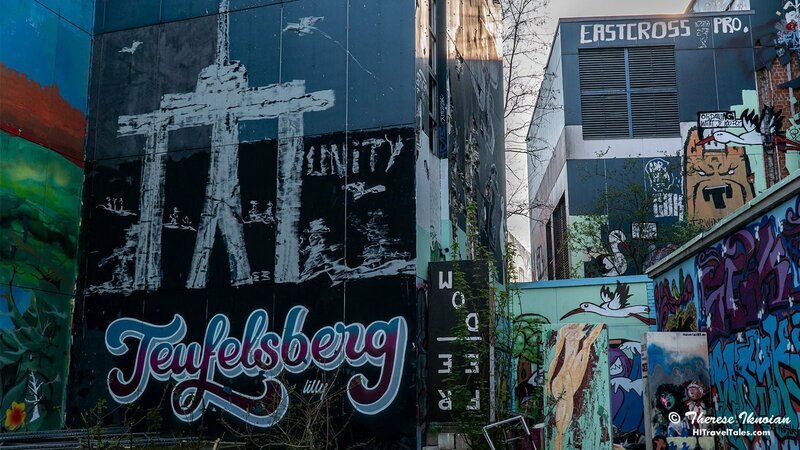 Following the fall of the Berlin Wall in 1989, the site was abandoned and fell into deep disrepair, helped along the way by plenty of vandalism and the destructive power of the natural elements. 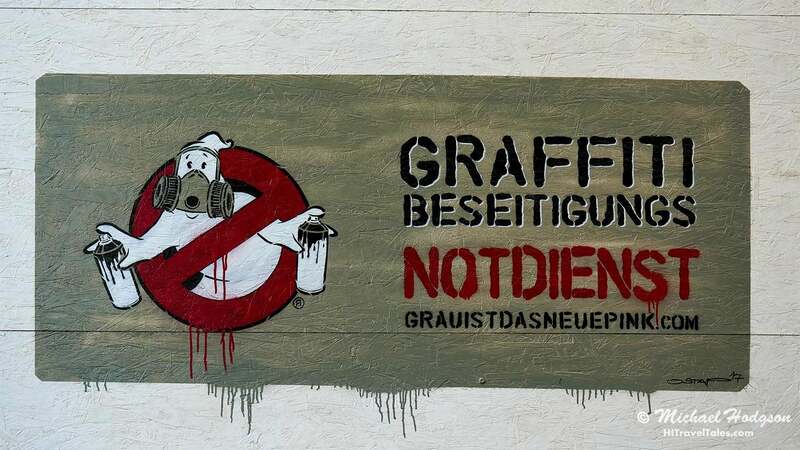 Attempts to commercialize the site never materialized. 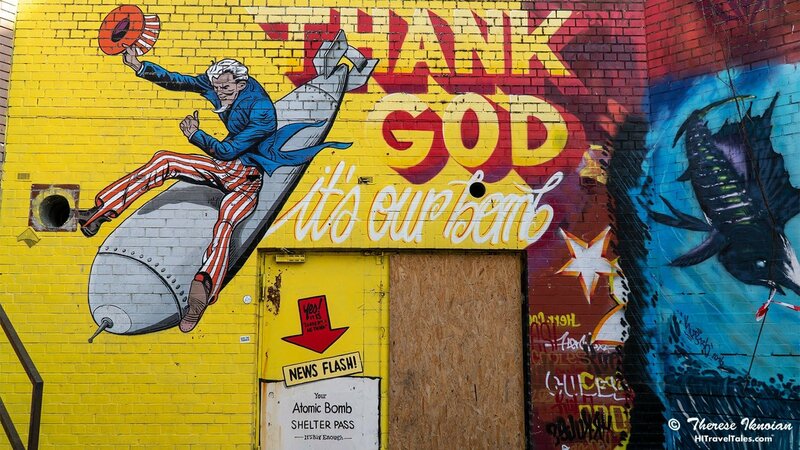 And while the former NSA station buildings were fenced off, street artists and others would sneak in increasingly often. 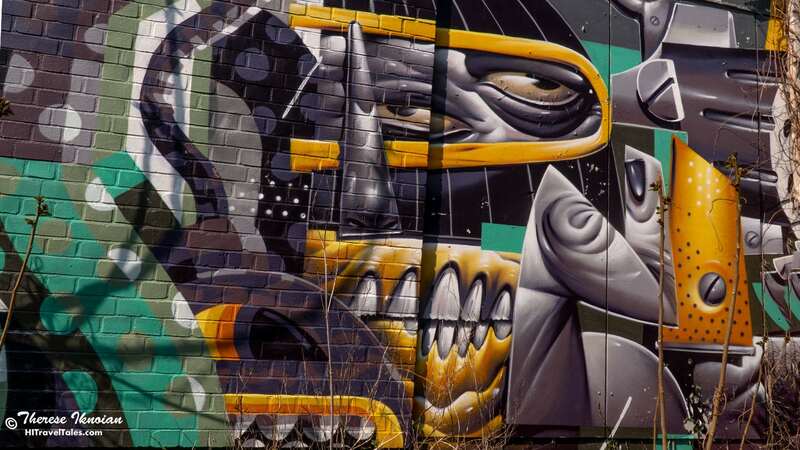 Some to leave their visual artistic mark. 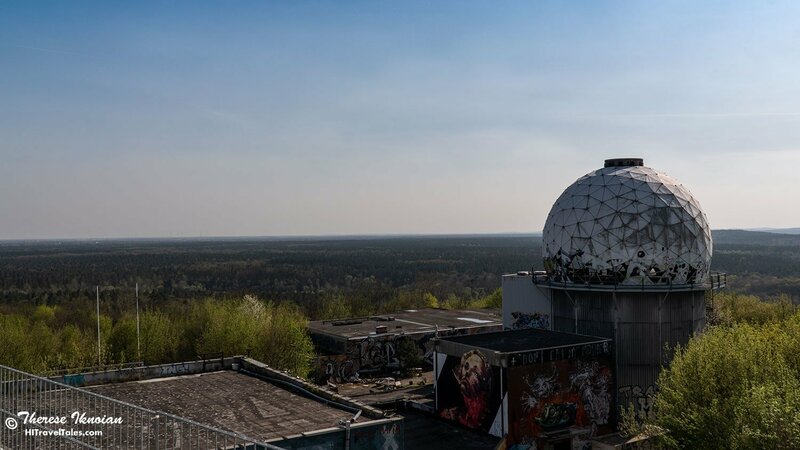 Others to climb abandoned stairwells onto elevated platforms and into the “radomes” (listening domes protecting radar stations) for amazing views of Berlin’s skyline. We visited one sunny April afternoon in 2018. 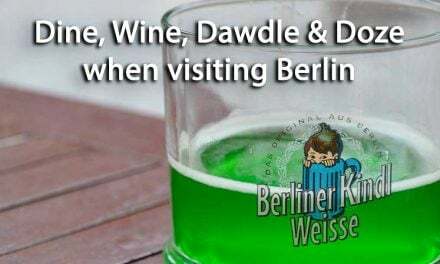 Only about eight miles west from Alexander Platz, one can see the signature white radome domes on the horizon from quite far away, inviting curiosity and beckoning the curious. 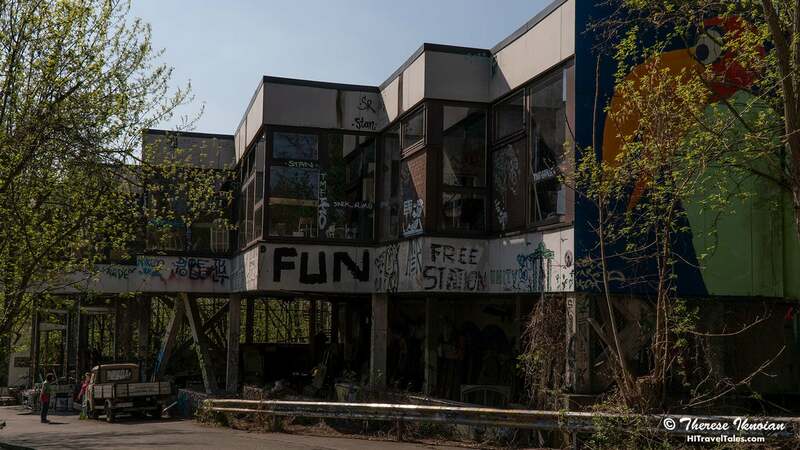 The former field station itself sits at the top of a now forested hill and a greenspace (“Grunewald”) crisscrossed by both paved and dirt walking and mountain biking paths – hard to believe this was merely rubble not so very long ago (924 million cubic feet where dumped here outside of then-Berlin from war cleanup). There is also a hilltop below called Drachenberg popular with hang gliders. Getting off at the Olympic Stadium S-Bahn station, we first walked through neighborhoods and then followed paths up to Teufelsberg (literally, Devil Mountain), mostly following our nose upward since the hill is looped and circled with so many paths. There are wild boars (we saw a small herd at one point) and boars can be aggressive, so stay alert when walking. 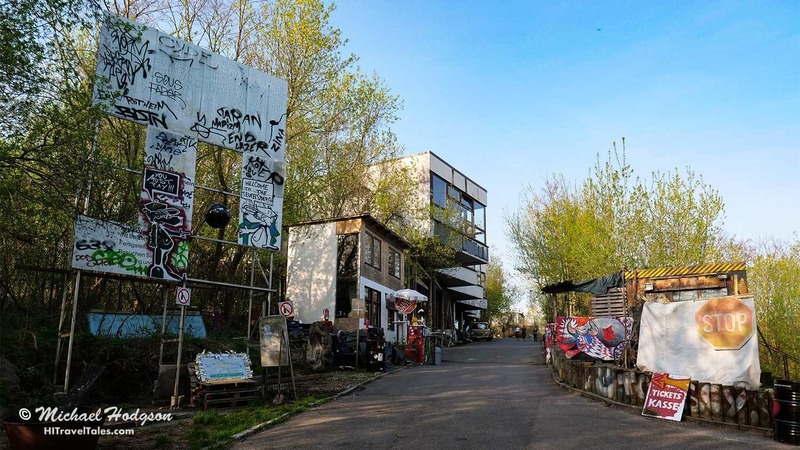 Probably like many other travelers, we got a bit off track, arriving on the back of the 12-acre Teufelsberg property from the main entrance gate, but one can easily follow the beaten-down path around to the front (following a chain-link fence heavily patched and repaired from numerous illegal forays into the former NSA station!). 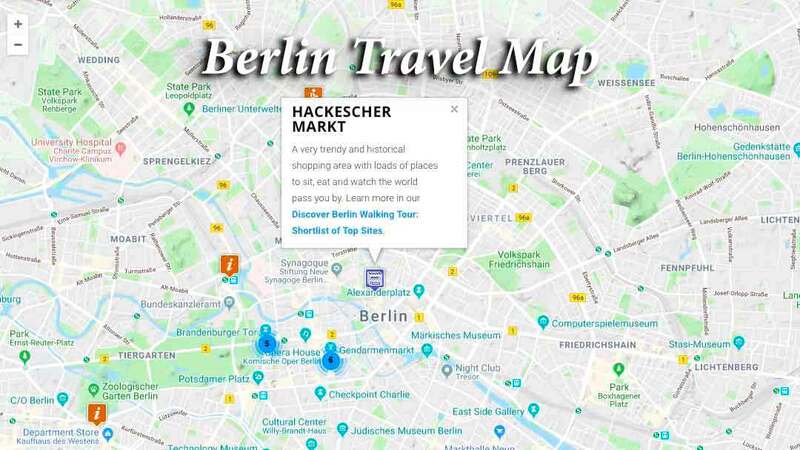 It’s hard to get lost, though – just keep looking and heading up — and you will find your way to the entrance gate at the end of a paved street officially at Teufelsseechausee 10. Parking is very limited so best to take public transit or park at the foot of the mountain and walk up. 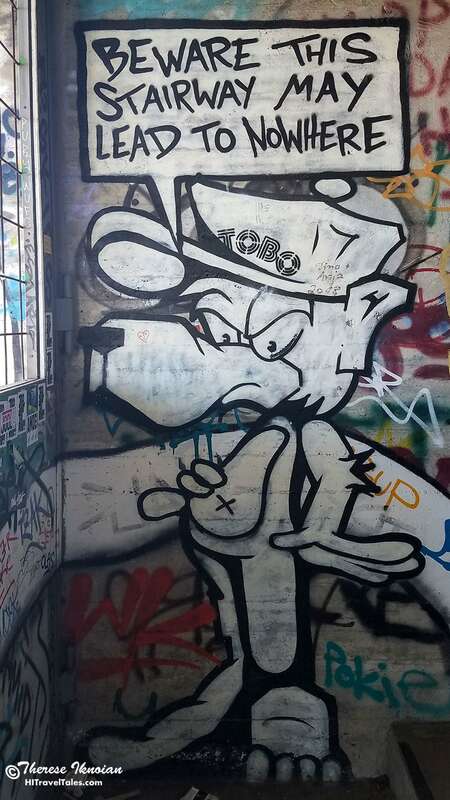 Welcome to the entrance gate at Teufelsberg. 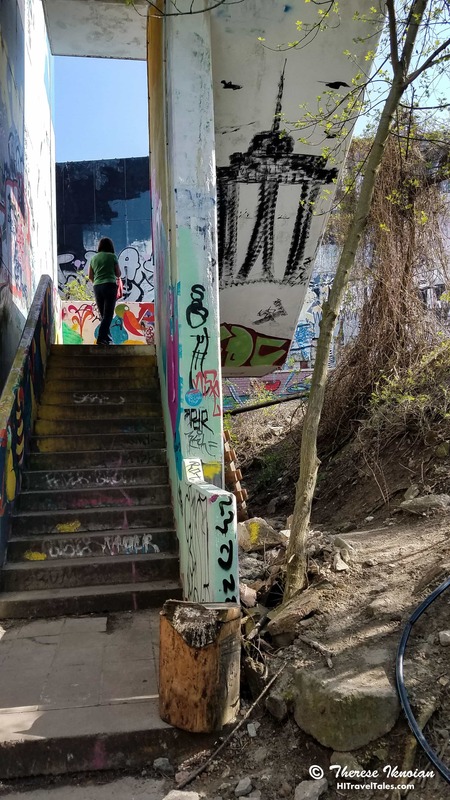 Even with tickets in hand from a rather casual cashier at the entrance, there was still something that felt a bit adventurous, perhaps even forbidden, about walking past piles of debris and the ruins of a former spy station. 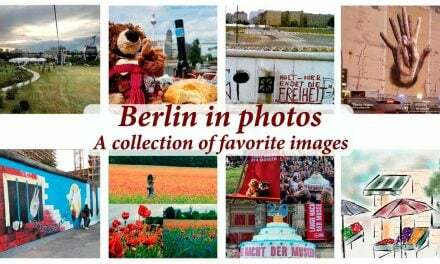 Buildings begged to be explored, and there is a lot to see for the truly curious. 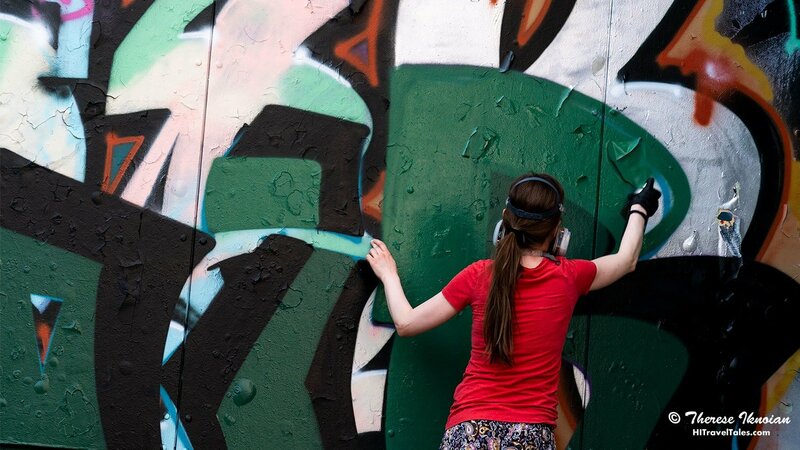 Graffiti and street art cover every inch of wall and bit of debris – no, really, every little tiny bit. The tatters of fabric that were once stretched tightly over the radomes above flap noisily in the wind. 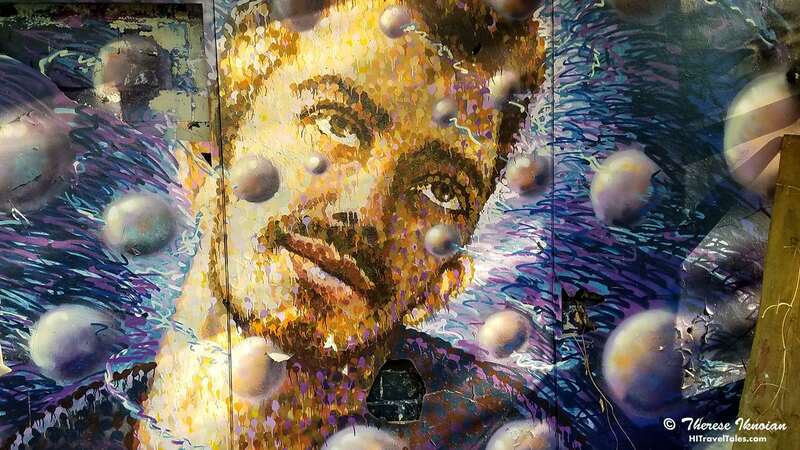 At the front, there is a café and informal beer garden of sorts with music playing, but once into the buildings, the music disappears and is replaced by whispers, sounds of flapping fabric, and the hum of generators powering spray paint guns. 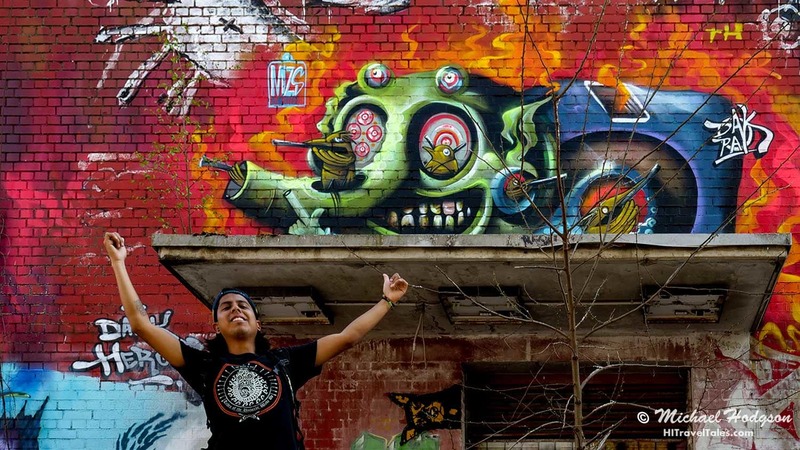 Street artists are always creating new works on all of the many levels of the ruins. 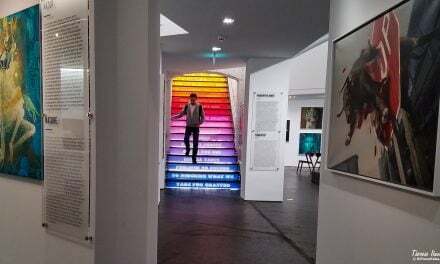 The art itself is colorful, irreverent, powerful, sometimes tasteful, sometimes grotesque or political, sometimes just odd, but always fascinating. We wandered throughout the various floors and then into a stairwell and upward that at times was pitch black (a phone flashlight saved the day). Yes, you could hear muffled voices of other visitors, but there was an undeniable uneasy feeling that perhaps, just perhaps, taking each next step up into the darkness was not a good idea. If you are like us, curiosity will win out, and up we went. The stairwell ended high inside a radome dome with its panels still intact. 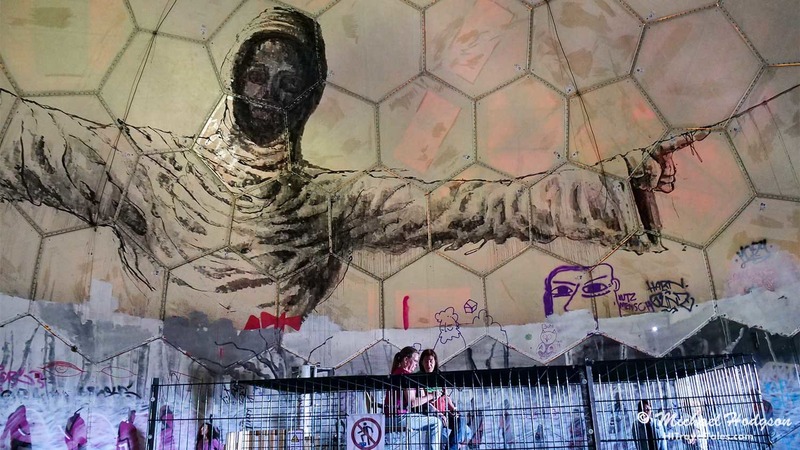 Street art covered the insides of the dome, and that was certainly cool. But what was most amazing were the acoustics. Stand smack in the center, and talk, clap, sing and the sound echoes around you, making an eerie kind of music. And if it is quiet and you are in the center talking in hush tones, you can be heard distinctly in all corners! And the view out over Berlin is exceptional from the top platform. All-in-all the experience is truly unforgettable. Not surprisingly, given our thoughts about safety with so many potential dangers from open stairwells with no guardrails to sharp edges from crumbling debris and unlit stairs, we discovered that as of Sept. 5, 2018, the government had stepped in and shut down public access up into the radome – for now. Mangers tell us the rest of the property is still open to visitors, and tours can still be booked too. And they are working on all the paperwork and other requirements to re-open the domes, so stay tuned. 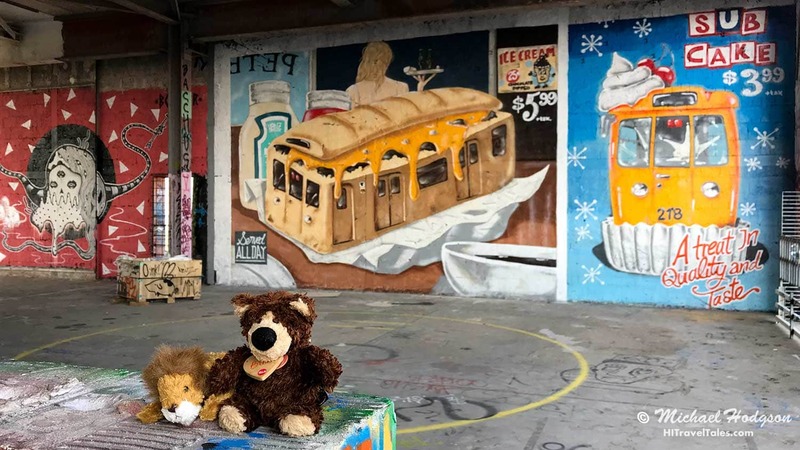 Enjoy a gallery of street art and images below from our adventure in Teufelsberg. 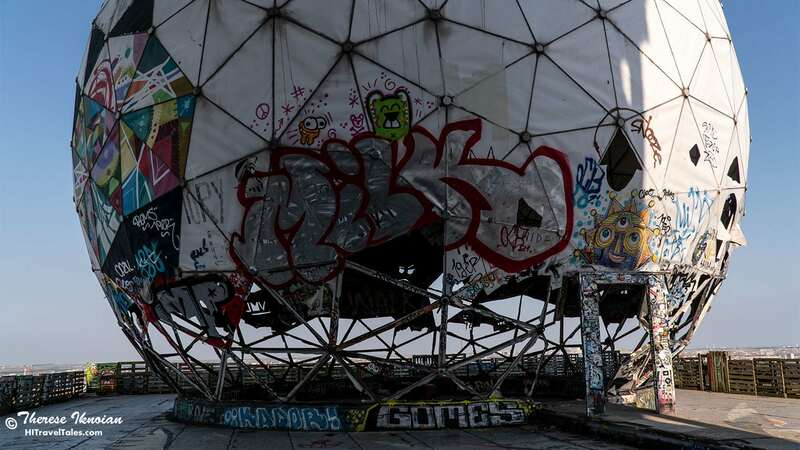 Be sure to listen to the haunting sounds from inside the tallest radome tower at the end of the post.